On 10 May, 2016 By Sean Keady With Comments Off on What makes a smart home smart? NEW YORK – May 10, 2016 – More consumers than ever see the benefits of buying a home with smart technology. A 2016 Coldwell Banker survey found that owners believe smart home technology makes their home safer, saves them money and saves them time. The same survey also found that 54 percent of homeowners would buy or install smart home products if they were selling their home because they believe it would make the home sell faster. 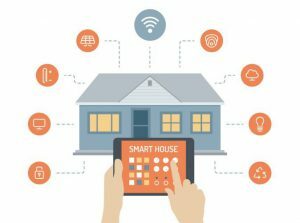 What are the benefits of smart home technology? Smart home technology automates household tasks like adjusting a home’s temperature, unlocking the front door or opening the garage door using voice-activation devices. Smart devices can work together to offer owners safety by alerting them if something in their home seems amiss, and it can save owners money by automatically controlling the temperature and energy of a home. Insurance companies and utility companies may offer reduced rates and rebates for homes with smart devices. Who owns the data, how is it used and are there security risks? What’s the impact on selling prices? On a large scale, the financial impact is yet to be seen since the technology is so new, but survey results showed that 72 percent of millennial owners would spend $1,500 or more to add smart home technology. Fifty-nine percent of parents with children would also pay more for a smart home, according to Coldwell Banker’s survey. IoT (Internet of Things): This buzzword describes automated devices like lights, thermostats and locks that work together and are connected by the Internet. IoT products use data to simplify things that previously weren’t automated. Hub: In the world of smart homes, a hub is almost like a universal remote, according to CRTLabs. A hub is the main device that connects all of the different smart home products together so they’re all automated. SmartMeter: These electric and gas meters help owners monitor their utility usage by sending real time meter readings.